Administrators can upload data models built with Oracle BI Enterprise Edition (OBIEE) to Oracle Analytics Cloud (OAC). After uploading a data model file (.rpd) to the cloud, content authors can then build data visualizations, dashboards and analyses in the usual way. To cover these topics, we will begin with Oracle BI Administration Tool in OBIEE (watch video 1&2); then we will switch to OAC to discuss how to upload a data model file (.rpd or BI repository) from OBIEE to the cloud. 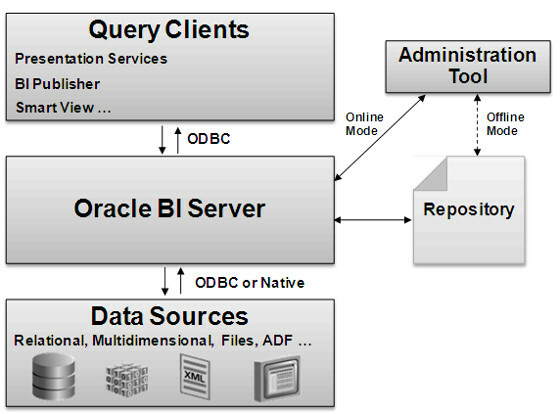 To view and edit the different layers of repository (see Figure 1), you use the Oracle BI Administration Tool. 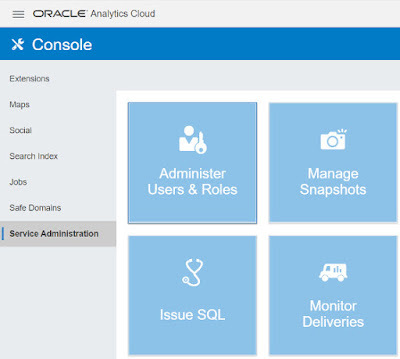 The Administration Tool client is a Windows application that you can use to create and edit your Oracle BI repository. 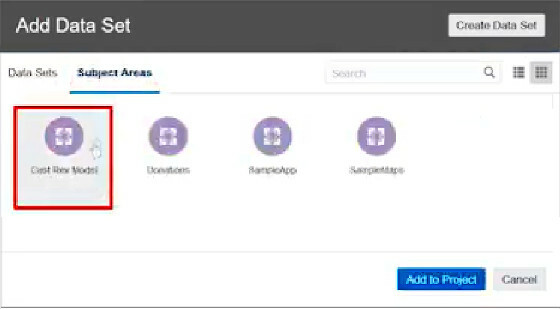 The Administration Tool can connect directly to the repository in offline mode, or it can connect to the repository through the Oracle BI Server. Some options are only available in online mode. See Using Online and Offline Repository Modes. In Figure 2, it shows how the Oracle BI Administration Tool interacts with Oracle BI Server, data sources, and the Oracle Business Intelligence (BI) repository. 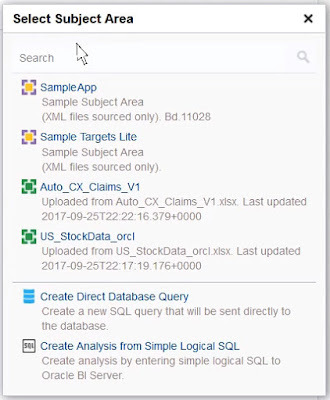 The Oracle BI repository contains the metadata that defines which columns you can include in analyses, and the source of that data. The repository is organized into subject areas, which contain folders with the columns. Defines the objects and relationships that the Oracle BI Server needs to write native queries against each physical data source. You can use Import Metadata from the File menu and setup data sources with appropriate connection information (see Figure 3). Provides the ability to federate multiple physical sources to the same logical object, enabling aggregate navigation and partitioning, as well as, dimension conformance and isolation from changes in the physical sources. 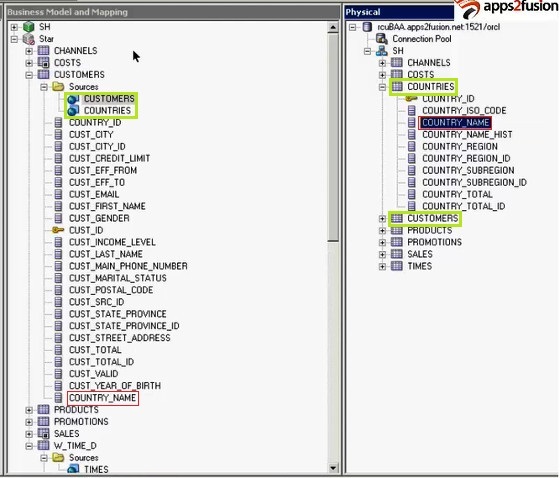 Enables the creation of portable Oracle BI Applications. Specifies the mapping between the business model and the physical schemas. Determines the analytic behavior seen by users, and defines the superset of objects and relationships available to users. Hides the complexity of the source data models. Uses the mappings to determine the best set of physical tables, files, and cubes for generating the necessary physical queries. The mappings often contain calculations and transformations, and might combine multiple physical tables. There is an extra folder named "Sources" which point to the physical schemas that the logical schema is coming from. You can have multiple physical schemas (i.e. CUSTOMERS & COUNTRIES) in the Sources folder (see Figure 4). Each column in business model maps to one or more columns in the Physical layer. Provides a way to present customized, secure, role based views of a business model to users. The repository in presentation layer is organized into subject areas. 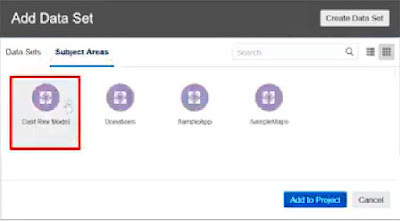 After you upload BI repository to the cloud (see the section below for more details), new subject areas will be shown in Analyses of OAC (see Figure 5&6). You use Oracle BI Administration Tool to view and modify the repository. After finish, you can save the metadata into a data model file (the RPD file). 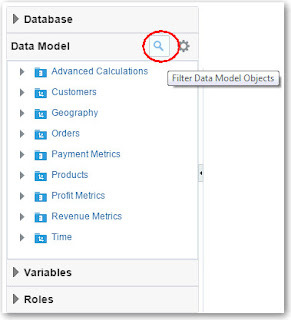 Administrators can then upload data models built with OBIEE to Oracle Analytics Cloud (OAC).instead of using Data Modeler to build them from scratch. Have one fact folder and a number of dimension folders. Select a subject area (see Figure 6) which contains columns related to a specific business object or business area. For example, SampleApp (see Figure 7). Then open folders within the subject area to find the columns to include in your analysis. 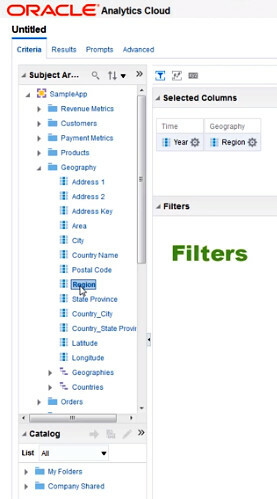 For example, you can open the Geography folder and select the columns within it. You can watch video 3 for more details. 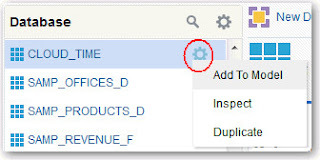 When you upload data models from OBIEE, you delete existing data model information in Oracle Analytics Cloud and replace it with content in the data model file (.rpd). The data models you upload become available to content authors as subject areas. Take a snapshot of the current data model in case you need to restore this version (watch this video). Click Replace Data Model (see Figure 8). In this article, we will cover how Dimensional Modelling works in Oracle Analytics Cloud (OAC). Using Data Modeler (see Figure 1) you can model data from various source types, such as star and snowflake, in various ways that make sense to business users. Although not all source objects have star relationships, Data Modeler presents data as a simple star structure in the data model. In other words, the data model represents measurable facts that are viewed in terms of various dimensional attributes. If you modeled your business data with Oracle BI Enterprise Edition, you don't have to start from scratch with Data Modeler. You can upload your data model to the cloud. In Data Modeler, the left pane shows the Database, Data Model, Variables, or Roles menu (see Figure 2). Action menus contain actions that are relevant for a particular object or context, and are visible when the object is selected. For example, if a source object in the Database menu is selected, its action menu shows: Add to Model, Inspect, and Duplicate (see Figure 3). Add source tables or views to the model and classify them as either a fact table or a dimension table. The right pane in Data Modeler is a contextual pane that changes depending on what task you’re performing. Every dimension table maps to at least one fact table, and that every fact table maps to at least one dimension table. When your HTTP browser session times out (after 20 minutes of inactivity), the lock is released and any unpublished changes are discarded. Similarly, closing a browser ends the HTTP session and discards any unpublished changes. After publishing your data model, you can start visualizing your data from your enterprise reporting Home page (see Figure 5 and watch video 1). Your data model displays as a subject area that you can use in visualizations, dashboards, and analyses (see Figure 6). The name of the subject area matches the name of your data model. When you model source objects with multiple star relationships, they’re all part of the same data model and are included in the same subject area. You must have the BI Data Model Author role (including table access permissions) to author data models. Allows users to administer Oracle Analytics Cloud and delegate privileges to others using the Console. Click Console (see Figure 7). Click Service Administration, and then click Administer Users and Roles (see Figure 8). 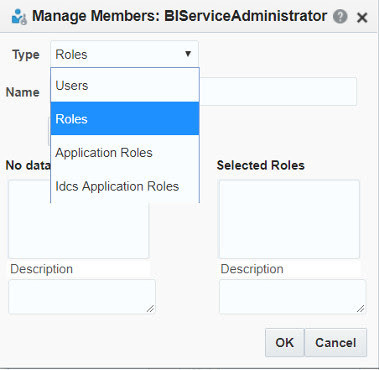 Click the Application Roles tab (see Figure 9). To display all available application roles, leave the Search field blank and Show Members: All. To filter the list by name, enter all or part of an application role name in the Search filter and press Enter. The search is case-insensitive, and searches both name and display name.